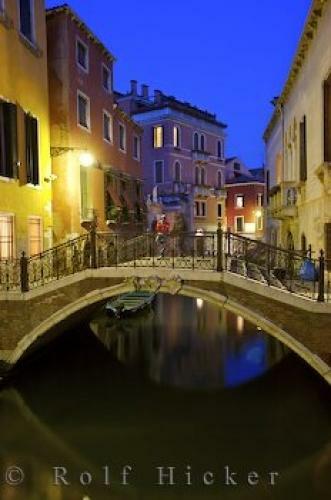 A water canal lined by quaint houses is quiet now that evening has fallen over Venice, Italy. During daylight hours the narrow canals, bridges, and streets of Venice are crazy with tourists eager to experience the romance of this great travel destination. As night engulfs the town, tourists return to their hotels on the mainland or enjoy some fine dining at one of the many restaurants, leaving the waterways and streets quiet. Water canal and bridge in Venice, Veneto, Italy, Europe. canal in Venice, Vento, Italy.